Sedona, Arizona, in the Red Rock area of Yavapai county. The image of the flag was originally seen on a sticker. Light blue over red flag -- the dividing line is a landscape skyline (possibly the Red Rock area of Yavapai country); this line trims a large yellow disc (approx. diam. 2/3rds of the flag's height), which undoubtedly represents the Sun. The (red) bottom of the flag (approx. height 1/12th of the flag's height) is separated from the rest by a thin horizontal white stripe (approx. thickness 1/24th of the flag's height). Above this line, extending from the center, the lettering "SEDONA" in white bold sans capitals, set with the typeface "Lythograph". The city flag was initiated by a local merchant who runs a flag and kite shop. He ran his own independent contest and had prominent local people judge the entries. The finalist's flag was then presented to the Council for their adoption as the City flag by a motion. The symbolism on the flag simply represents the rock formations around Sedona. 'Edwin's Stuff' (eBay store) acting as "edwinart" recently presented a different flag, of related design it is true, but the status of which is unclear to me. It is described as : "roughly 3x5 feet. Acquired in late 70s. Made by Nyl-Glo ~ 100% nylon bunting ~ Annin & Co. high quality flag. All sewn construction. All graphics sewn on front and back" and "this and other flags were part of the Tumbling Waters Museum which sold out the collection in the early 80s to the Heritage Society because of financial difficulty in keeping the museum running, I was told." 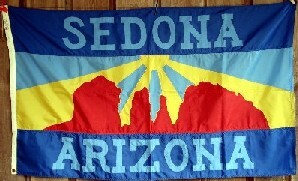 The eBay image flag is horizontally divided 1:2:1, the upper and lower stripes are dark blue each bearing a name, 'SEDONA' and 'ARIZONA' respectively, in light blue serifed letters; the central stripe is light blue with a red rock formation over which a yellow sun - only the lower half of which is visible - sheds its light in four broad rays. 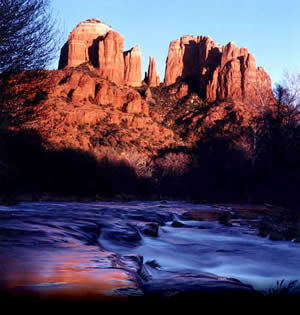 "As you continue north on Dry Creek Road, you might be able to spot Cockscomb to the left, the jagged silhouette depicted on Sedona's city flag. The trio of spires on the right is Chimney Rock, locals refer to it as Three-Finger Rock." A "rectangular magnet" showing the version above can be seen at magnets.cafepress.com/item/sedona-az-flag-rectangle-magnet/162747881. There appear to be variants of this flag. Having in mind that I read that the collection of flags Jan reported from e-bay is from 1970's, I assume this is former flag of Sedona. As a frequent visitor to Sedona I think Valentin is right (and besides, it was never official). I have tried to buy the 3" by 5"" flag at Ron Sievart's Flag And Kite Factory on the main drag of the town, Highway 179, but they were always out of it - must be very popular item. They have the flag in many larger sizes. I was told the flag (at the top of this page is official, but I didn't see it widely displayed - stickers are. The older flag could have been promotional, maybe used by the local Chamber of Commerce in the past? The website at www.city.sedona.net showed a triangular seal with a crimson border and with the apex pointing downward. The top of the seal consists of a side profile of Midgely Bridge, and underneath its arc a blue sky with fleecy white clouds is visible. The foreground consists of two canyon walls in earth tones, spanned by the trestle. The lower right vertex of the triangle contains the words 'CITY OF' in small white capitals, with the word 'SEDONA' written in the same fashion in the lower left vertex. At the apex of the triangle there is a light blue diamond. The city logo . . . was the result of a contest that was held when we first incorporated in 1988. Local artists then entered the contest and the top three [designs] were then voted on by the citizens. The winner was an artist named Sunshower. The bridge at the top of the city seal is actually a side profile of Midgely Bridge, a roadway bridge immediately north of Sedona's city limits, on Hwy. 89A en route to Flagstaff. The bridge was built in 1939.